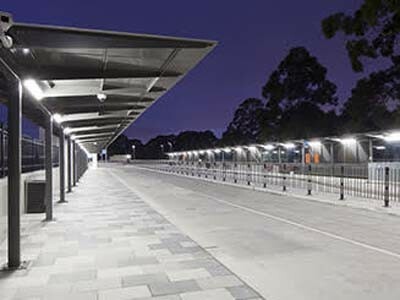 Stoddart Australia was commissioned to design, fabricate and install several large-span walkway-style bus shelters at the Gordon Station Interchange in New South Wales. Working in conjunction with A.W. Edwards on behalf of Transport of NSW, Stoddart utilised their experience in patron-focused transport products as well as extensive knowledge and resources in steel fabrication for the successful execution of the project during the recent upgrade of the station. Designed to visually and physically integrate into the surrounding interchange infrastructure, the bus shelters provide direction and protection for public transport patrons with features such as a large-span cantilever design, high output lighting, and comfortable seating and ancillary street furniture. The Gordon Station Interchange upgrade is the latest in a series of projects delivered by Stoddart to the Transport for NSW and perfectly showcases the company’s ability to develop solutions that blend with the environment, as well as satisfy their customers’ needs.